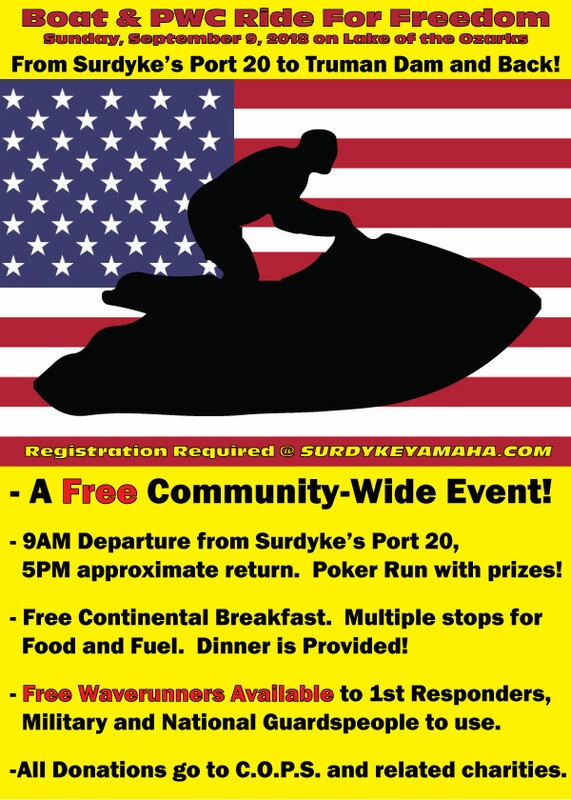 If you are a Lake Area 1st Responder (Fire, Police, EMT, National Guard, Etc) Surdyke Yamaha would like to provide you with a Free Yamaha Personal Watercraft for the day! Surdyke Yamaha in Osage beach wants as many first responders and military as possible. Please sign up early to help us provide boats and PWCs. Early registration gets you a better ride. Last minute dude might be in a tube being pulled by a canoe. You will be responsible for your own fuel fill ups and any damage of course. The PWCs seat up to 3 people (2 comfortably) so feel free to bring a friend or significant other! If you are a 1st Responder or Military, what is your branch of Service? Please don’t sign up and not show up, you may keep someone else from being able to participate. The 2018 Boat and PWC "Ride for Freedom" event is to honor the memory of 9/11/2001, and to celebrate and support our area's First Responders and Military! The Ride is free, but we are suggesting a $100 donation for those that can afford it. 100% of the donations go to related charities. The Concerns of Police Survivors (C.O.P.S. ), the Cadet Thomas Surdyke Memorial Foundation, Supporting Heroes, and The Mission Continues charities. Please click the link below to donate.